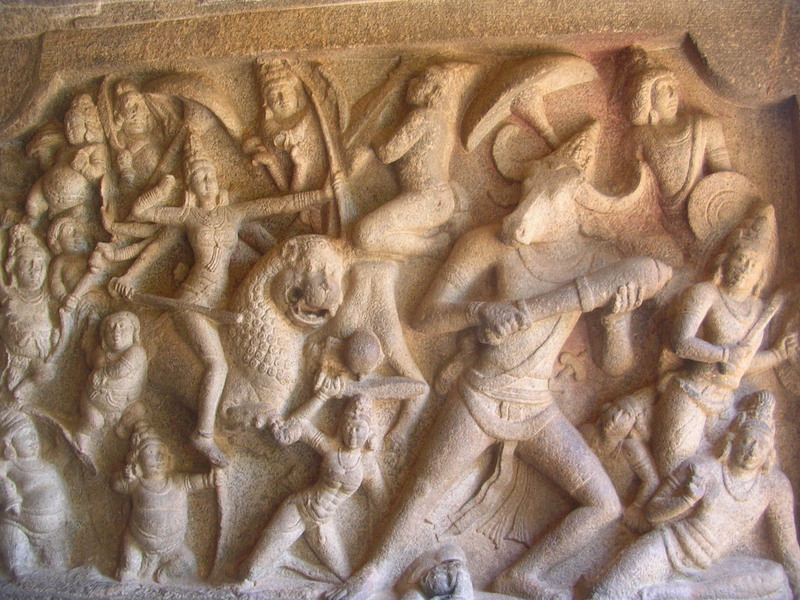 Considering that the first of the ethical principles listed in the Yoga Sutras is non-violence (ahimsa), it may seem strange to have asanas named “warrior”-virabhadra. However, as one advances in the path of yoga, the metaphor of virabhadrasana and the battle may ring a bell or two. Practising yoga is a continuous challenge beyond the physical plane, as we are confronted with the qualities of our priorities, limitations, fears, determination, compassion… It seems like there should be a great reward at the end of all this – and yet, this end seems to keep sliding away from us in the form of infinite variations and subtleties in the practice. Thus, the goal is to keep renewing one’s commitment to refining one’s awareness beyond what one can imagine, sometimes walking into the dark, not knowing where to or what for, feeling one’s way step by step. Perhaps its not a battle, but sometimes it can seem like a heroic quest. There are many similarities between the yogi/yogini and the hero/heroin. In the symbolic tradition, the hero is a searcher, who sets off to fulfil their destiny, to make sense of their existence. In so doing, they embark upon a journey of self-knowledge which is fraught with trials. At some point, the hero falls prey to illness or hopelessness and seems about to lose course and fail at their mission. This marks the hero’s internal deficit emerging into awareness. As the self-image is fractured, the crisis begins. Only as the ego dies can the hero be reborn to a higher level of consciousness. In the midst of the crisis, it is no longer possible to resist with one’s usual resources. The way out is through giving up what is known, accepting mortality and having faith as one steps into the void. It is death that gives meaning to life and the acceptance of the deaths we encounter throughout life opens us to experience life as it is. Anybody who has practised yoga will be familiar with the ups and downs related totiredness, distraction, injuries, disillusion and many other obstacles which all point back to ourselves. Am I willing to carry on practising when I can’t do my favourite asanas? When there’s no apparent progress? When I need to prioritise? When all I can do is a short or restorative session? When it makes it painfully obvious that I’m all over the place? Of course, there’s no must. And yet, the hero/heroin, the warrior, cannot help but set off on the journey. So, what does this imply for the warrior poses? Perhaps just allowing these ideas to be present next time you practise virabhadrasana can bring some insights. I’ll be sharing my own, derived from the physical experience of the postures, very soon, watch this space. If you’d like to go further, I suggest reading about Gilgamesh, Odysseus, Arjuna, Buddha or Moses. The women include Grusha in ‘The Caucasian Chalk Circle’ by Bertolt Brecht and Inanna. Joseph Campbell explores the topic in detail in his book ‘Hero with a Thousand Faces’. It is harder to find symbolic heroins, but that only speaks about culture, not about the heroic path of women. If you’d like to share any inspiring examples, male or female, please do. This article is dedicated to Paco Peñarrubia, my Gestalt mentor in CIPARH, Madrid. My understanding of the figure of the hero is directly derived from the teaching and experiential work facilitated by Paco in his workshop “The Four Faces of the Hero”, which I took in 2007. If you are interested in trying one of my yoga classes, click here and scroll down to the yoga section to find out where and when. You can contact me here if you need further information.